An SCAQMD air permit is a legal document issued to a single piece of equipment at a specific location. Each permit consists of two pieces of information: an equipment description and a set of conditions. The permit conditions ensure that the equipment complies with all of the applicable rules that pertain to the equipment, while the equipment description identifies the piece of equipment that has been issued a permit. The equipment description is important given that a permit can only be issued to a single piece of equipment at a specific location. The description also allows an SCAQMD inspector to identify the actual equipment from the permit document itself — something that all inspectors do when coming onsite to conduct an inspection. This is why it’s so important to have the equipment description on the permit match the equipment installed in the plant (make, model number, equipment size, etc.). Doing so can help prevent allegations that unpermitted equipment modifications or installations have been made. The heart of the permit wording system is dependent upon a definite sequence of descriptive terms usually, but not always, set off from each other with commas. Each of the terms appearing in the sample given below is listed in the order in which it is to appear in the description. NAME OF DEVICE, REFERENCE NUMBER, MATERIAL PROCESSED, MANUFACTURER’S NAME, TYPE, MODEL NUMBER, STYLE, SIZE, DIMENSIONS, SERIAL NUMBER, ENERGY INPUT AND HEATING METHOD, ACCESSORIES, PLANT OR EQUIPMENT ACCOUNTING NUMBER. The sequence of the information provided is important and follows strict conventions for each. While most of these items are straightforward, there are five key points to keep in mind. 1. We do not recommend adding a serial number to your permit. 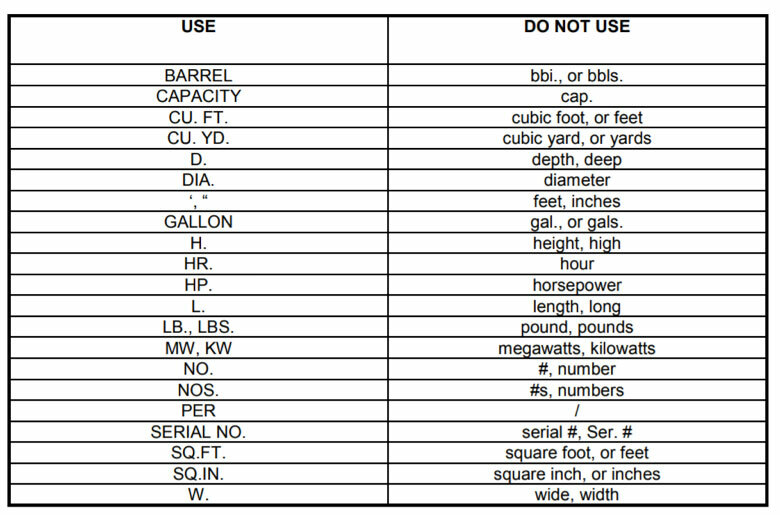 While the SCAQMD’s CPP manual notes that serial numbers are only added to equipment holding various location permits, we also see cases where serial numbers have been added to other types of equipment. The reason for this is rooted in uniqueness: A serial number to a piece of equipment is a unique ID — meaning no two pieces of equipment can have the same serial number. So including the serial number could pose a problem if you need to replace your equipment — for example, if it becomes damaged — even if you’re replacing it with a functionally identical replacement. SCAQMD Rule 219 (c)(3) exempts replacement equipment that is a functionally identical replacement from permitting. However, having the serial number on the permit would invalidate it, as the replacement equipment would, of course, have a different serial number. 2. When providing equipment dimensions, use the outside shell measurements in feet and inches. It’s quite common for industrial equipment to have an outside and inside dimension. In most cases, you need to use the outside shell dimension, provided in feet and inches, when drafting your permit description. For example, if you have a boiler that is 41 inches high, that information should be written in the description as 3’ 5”. If you do need to provide the inner dimensions, such as for an automatic spray booth used to paint cars, note this in the description so that it is clear. 3. Provide the type of fuel used to power the equipment, as well as the capacity, in its entirety. When describing combustion equipment, include the type of fuel, both primary and secondary (backup, if applicable), and spell out the capacity in its entirety. For example, if a boiler is fired on natural gas, with a rating of 6 MMBTU/hr (6 million British thermal units per hour), then you need to specify the heat rate as 6,000,000 BTU per hour — not 6 MMBTU/hr. 4. Do not include trade names when adding accessories to an equipment description. When writing your equipment description, it is sometimes necessary to include accessories, such as combustion air blowers, scrubbing media, exhaust fans, etc. When describing accessories, we recommend omitting trade names from any part of the description, whether it be the accessory or the equipment itself. Just as with serial numbers, including the trade name makes it difficult to replace your equipment, should you decide to replace the equipment with a product by another company. 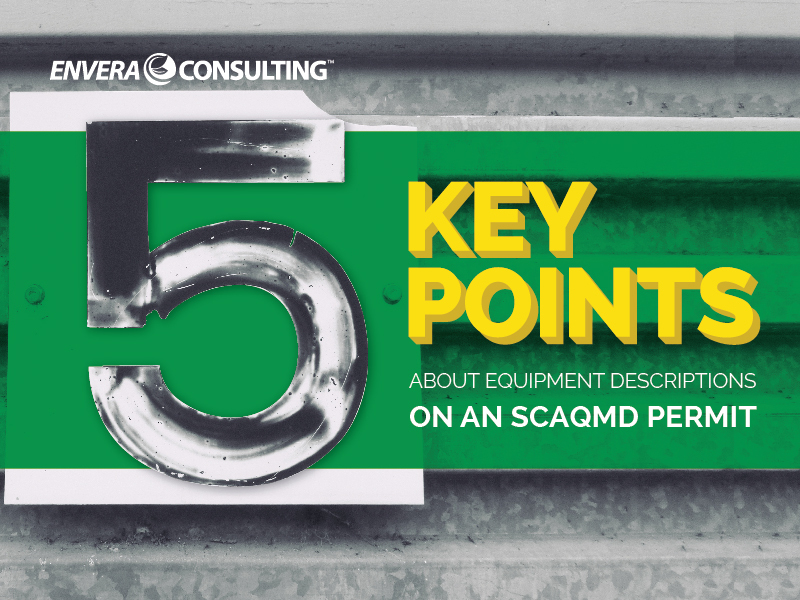 While describing a piece of equipment can sound straightforward, how you would describe it to your friends is almost always going to be different than the way that the SCAQMD describes the same piece of equipment on a permit. Knowing this exact process, as well as the conventions used when doing so, greatly helps when drafting an accurate description that won’t cause you headaches down the road.